Florence Nightingale may seem like a strange choice to start a series about women who deserve greater recognition, but Florence Nightingale pretty much sums up the dilemma for women in the public eye. We all know “The Lady with the Lamp”. Certainly when I was growing up, when Blue Peter wanted to educate as well as entertain, there were regular features on how she care for injured soldiers during the Crimean War. This view of Florence emphasises her role as a carer, a role model for all little girls who want to make their way in the world; be gentle and loving and look after men. However Florence lived for 50 years after returning from the Crimean and was much more than a ‘ministering angel’. She had a gift for mathematics and became a pioneer in statistics, particularly in the visual presentation of information. She used methods such as the pie chart and is credited with developing a novel form, a type of circular histogram, now known as a polar area diagram. She developed this method as a way of visually illustrating the seasonal sources of patient mortality in the military field hospital she managed. She understood that military leaders, civil servants and politicians would probably not understand lengthy statistical reports, even if they read them at all, so visual representation was crucial if her messages from field hospitals were to be understood and, importantly, acted upon. The diagram she developed only sometimes bears her name; the Nightingale Rose Diagram. In 1859, Florence was elected the first female member of the Royal Statistical Society and later became an honorary member of the American Statistical Association. Using statistical analysis, Florence demonstrated that bad drainage, contaminated water, overcrowding and poor ventilation were at the root of the high death rate in the field hospitals. She took this learning and went on to make a comprehensive statistical study of sanitation in India and was instrumental in the introduction of improved public health. In 1868 she pressed the Royal Sanitary Commission to make sanitation compulsory in private houses. She lobbied the minister responsible to require property owners to pay for connection to mains drainage. 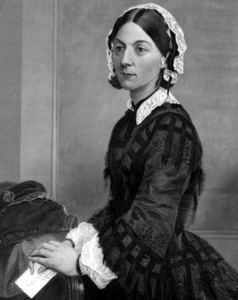 While Florence Nightingale is not noted as a feminist, famously when asked to put her name to the women’s suffrage movement she declined, saying that she didn’t have enough time and was too sick, her novel Cassandra protests the over-feminisation of women, such as she saw in her mother’s and sister’s lifestyle. Rather than being active in the movement she likely felt that, by working so hard to improve public health, she was doing something for women by her actions. Certainly her profile as a mathematician, statistician and tireless worker to improve public health means that she deserves higher recognition than simply the Lady with the Lamp.